Nepal is in the middle of a long political crisis that affects the everyday lives of most of its citizens. 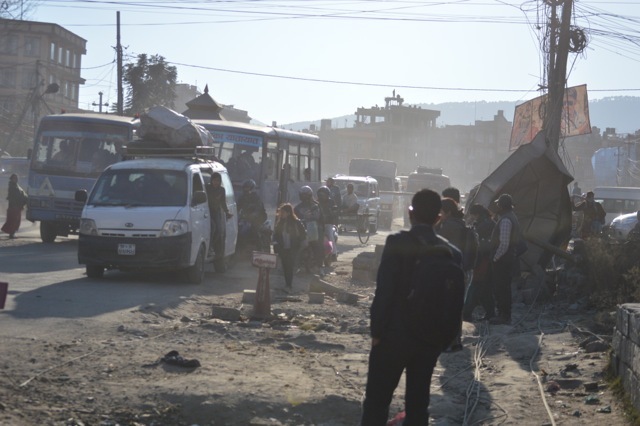 The infrastructure of the Kathmandu Valley – where we stay, is struggling to cope with 21st Century needs with an ever-growing population. In winter there are about 14 hours a day without electricity, there are water and gas shortages, and this year, general strikes to delay a draft constitution. Welcome to Nepal! Nepali people are forced to put up with these and many more impediments in their every day life. And these, of course, affect us, and our projects, as well. This was our third art program in Nepal. We intended to spend one month in Bhaktapur with the Children’s Art Village and the Unatti Girls Home, building on our very successful arts and education programs from two previous years. We planned to develop their stories through theatre and art, and to strengthen their creativity and imagination. We also planned to give classes in the arts and community development at the Nepal School of Social Work where last year we ran professional development training for teachers. This year we intended to build on that program with undergraduate students. Since our last visit to Nepal have been many changes. The Unatti girls have moved into a spacious new house; it has plenty of room and the privacy conducive to their needs as growing young women. However, this came with the loss of the outside space where last year we ran the drama classes, and a large communal room in which to run the art program. Another change has been the loss of the Children’s Arts Village space behind the chemist shop. It is now a building site. The public square outside, where we sometimes ran our program when there were lots of children, is also lost to the building site. A hotel project is replacing the Children’s Art Village. The loss of these three outside spaces had a huge impact on the project. All the activities that used to go on these spaces were now expected to happen on the rooftop terrace at the Unatti Girls Home. Whilst the terrace is a great space as part of the house it is not conducive to working with large groups of children. Additionally, the Children’s Art Village could only be held on Saturday mornings and we were not able to run the 4-5 days a week program that we had planned. We know that it will take time for Unatti and the Children’s Art Village to settle into how these spaces and projects can work together. But it meant that this year we had to run a smaller program with both organisations; we also understood that we needed find other groups to work with. We felt excited and delighted to see our friends at Unatti. The girls were keen to be involved and especially wanted to learn more about painting and working with clay. We showed them painting skills such as using shadows and placing objects in space. We worked on the figure in clay, and introduced them to making hand-made books. Some of them show incredible talent and commitment to art. One of the main problems with the education system in Nepal is that students learn through copying and by rote. It is vary rare for students, especially girls, to be taught and encouraged to use their imagination or experiment with something new. We see the effects of this style of learning in all aspects of Nepali life and how the Nepali people approach change and challenge. Anne introduced the girls to the artist Vasily Kandinsky and his ideas of the abstract. We wanted to spark the girls’ imaginations and encourage them to tap into their creativity and intuition, and to let go of pre-conceived ideas. It is very hard to break old habits; nonetheless the girls are open to trying new things and enjoyed the opportunity to let their ideas and the paint flow. As a first step towards creating and performing their own stories, we dramatized some of their favourite European and Nepali folk tales with their themes of kings, queens, gods and demons. It was delightful to watch the girls work as a group. We especially enjoyed seeing them draw on the mime, clowning and character work they had learned in the two previous programs to make their performances rich and engaging. They loved performing for each other and for their housemothers. As usual, the children who come to the Children’s Art Village were excited and enthusiastic – there is a deep desire within them to learn and participate. Nonetheless, many have demands placed upon them that keep the out of school and many children have to work. They are generally undernourished and unused to the structure of a dynamic learning environment. Because we had a lot of time with them last year, and in a space that they felt that was theirs, they developed creatively and personally. This year there were few opportunities for us to support their creative learning and to get beyond the first stage of the program. This was a big disappointment to us as well as for the children. We used this unexpected gap in our program to jump at the opportunity to work in the brick factories. Our projects with new communities always happen in unexpected ways. We met Nirmala KC and Subarna Thapa through Shivani Saria, a lecturer at the Nepal School of Social Work and a fellow delegate at the conference in Kerala. Nirmala and Subarna are child protection/social workers with Urban Environment Management Society (UEMS), an organisation trying to improve the conditions and lives of the men, women and children in the brick kilns dotted around the Kathmandu Valley. At our first meeting with UEMS we learnt of their concerns about childhood sexual abuse and family violence in the kilns. They were interested in Anne’s work in the sexual abuse field and wanted some suggestions and help as they were having difficulties developing the trust necessary to address these sensitive issues. They also wanted our help and expertise to promote better health, hygiene and nutrition. We offered them an arts and drama program which we felt sure would help strengthen community relationships and address these issues. close collaboration with community leaders (UEMS) is essential. We spent a very fruitful, enjoyable and challenging few weeks with them at three brick kilns and one community school. It was wonderful to see an immediate and high level of interest and participation from all the community – from children to fathers to grandmothers. They found art very relaxing and the drama and mime very enjoyable. UEMS provided plenty of materials, and it was great to be in a position to encourage the participants with all the paper they wanted and a good range of crayons, pastels and paint. This was luxury for these people. Nirmala and Subarna are passionate about their roles as social/child protection workers. As they saw community trust developing they felt confident to address some of the more sensitive issues. We have been delighted to hear that they have implemented our art program in other brick kilns with great success. We expect to work with UEMS when next we visit Nepal. Another highlight has been that we were able to continue at the Nepal School of Social Work and train students in theory and practice around the inclusion of art and drama in social work practice. Some students had already used drama as a communication tool to promote their programs and raise awareness and we were able to support and encourage their learning. We also helped shape their understanding of the commitment, imagination and perseverance required to be useful social workers, which is a new profession in Nepal. We were really happy to have an intern and new graduate from this school join us in the brick kiln project and were very impressed by their participation. Nepal is a wonderful place to spend time – we love immersing ourselves in community life, seeing old friends and making new ones. We love seeing people become engrossed in their arts practice, and develop as a result. We enjoy the lack of rigidity in everyday life, that you can hail a bus and it will stop and wait for you although we have no idea where the bus stop is, and that people will always help with directions and language. The beauty of the mountains and hills never fails to inspire wonder, and the life on the street is always about community, meeting, engaging and participating. We are never lonely in Nepal. But it also a challenging place; the lack of power is felt in so many ways that are uncomfortable for us and immensely difficult for the Nepali people. The general strikes impacted our day to day planning and the availability of schools and communities to participate in our projects. And the pollution means the air is never fresh and the landscape often blemished by mounds of plastic. So when people ask about our time in Nepal – we say it was everything – great, challenging, uplifting, grueling, and wondrous. We thank our many supporters, including the Children’s Art Village, for providing funds to make this project possible. Artists in Community International donate our time and some costs to the project. Thank you so much for sharing the post. Really enjoyed reading it. Totally understand what you mentioned about the education system in Nepal. Really hope things would change someday, even if gradually. Keep in touch. Thanks Shivani – I am sure Nepal will gradually improve in many ways – thanks to the input of its many dedicated citizens, such as yourself.